The Software Engineering Professional Practice knowledge area (KA) is concerned with the knowledge, skills, and attitudes that software engineers must possess to practice software engineering in a professional, responsible, and ethical manner. Because of the widespread applications of software products in social and personal life, the quality of software products can have profound impact on our personal well-being and societal harmony. Software engineers must handle unique engineering problems, producing software with known characteristics and reliability. This requirement calls for software engineers who possess a proper set of knowledge, skills, training, and experience in professional practice. The term “professional practice” refers to a way of conducting services so as to achieve certain standards or criteria in both the process of performing a service and the end product resulting from the service. These standards and criteria can include both technical and nontechnical aspects. The concept of professional practice can be viewed as being more applicable within those professions that have a generally accepted body of knowledge; codes of ethics and professional conduct with penalties for violations; accepted processes for accreditation, certification, and licensing; and professional societies to provide and administer all of these. Admission to these professional societies is often predicated on a prescribed combination of education and experience. A software engineer maintains a professional practice by performing all work in accordance with generally accepted practices, standards, and guidelines notably set forth by the applicable professional society. For example, the Association for Computing Machinery (ACM) and IEEE Computer Society (IEEE CS) have established a Software Engineering Code of Ethics and Professional Practice. Both the British Computer Society (BCS) and the International Federation for Information Processing (IFIP) have established similar professional practice standards. ISO/IEC and IEEE have further provided internationally accepted software engineering standards (see Appendix B of this Guide). IEEE CS has established two international certification programs (CSDA, CSDP) and a corresponding Guide to the Software Engineering Bodyof Knowledge (SWEBOK Guide). All of these are elements that lay the foundation for of the professional practice of software engineering. 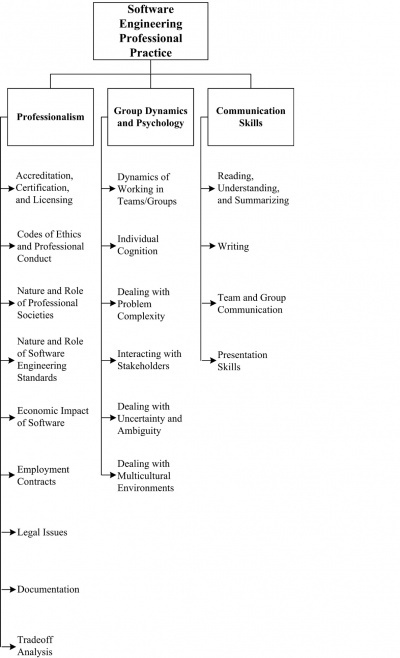 The Software Engineering Professional Practice KA’s breakdown of topics is shown in Figure 11.1. The subareas presented in this KA are professionalism, group dynamics and psychology, and communication skills. A software engineer displays professionalism notably through adherence to codes of ethics and professional conduct and to standards and practices that are established by the engineer’s professional community. The professional community is often represented by one or more professional societies; those societies publish codes of ethics and professional conduct as well as criteria for admittance to the community. Those criteria form the basis for accreditation and licensing activities and may be used as a measure to determine engineering competence or negligence. Accreditation is a process to certify the competency, authority, or credibility of an organization. Accredited schools or programs are assured to adhere to particular standards and maintain certain qualities. In many countries, the basic means by which engineers acquire knowledge is through completion of an accredited course of study. Often, engineering accreditation is performed by a government organization, such as the ministry of education. Such countries with government accreditations include China, France, Germany, Israel, Italy, and Russia. In other countries, however, the accreditation process is independent of government and performed by private membership associations. For example, in the United States, engineering accreditation is performed by an organization known as ABET. An organization known as CSAB serving as a participating body of ABET is the lead society within ABET for the accreditation of degree programs in software engineering. While the process of accreditation may be different for each country and jurisdiction, the general meaning is the same. For an institution’s course of study to be accredited means that “the accreditation body recognizes an educational institution as maintaining standards that qualify the graduates for admission to higher or more specialized institutions or for professional practice” . Certification refers to the confirmation of a person’s particular characteristics. A common type of certification is professional certification, where a person is certified as being able to complete an activity in a certain discipline at a stated level of competency. Professional certification also can also verify the holder’s ability to meet professional standards and to apply professional judgment in solving or addressing problems. Professional certification can also involve the verification of prescribed knowledge, the mastering of best practice and proven methodologies, and the amount of professional experience. An engineer usually obtains certification by passing an examination in conjunction with other experience-based criteria. These examinations are often administered by nongovernmental organizations, such as professional societies. In software engineering, certification testifies to one’s qualification as a software engineer. For example, the IEEE CS has enacted two certification programs (CSDA and CSDP) designed to confirm a software engineer’s knowledge of standard software engineering practices and to advance one’s career. A lack of certification does not exclude the individual from working as a software engineer. Currently certification in software engineering is completely voluntary. In fact, most software engineers are not certified under any program. “Licensing” is the action of giving a person the authorization to perform certain kinds of activities and take responsibility for resultant engineering products. The noun “license” refers to both that authorization and the document recording that authorization. Governmental authorities or statutory bodies usually issue licenses. Obtaining a license to practice requires not only that an individual meets a certain standard, but also that they do so with a certain ability to practice or operate. Sometimes there is an entry-level requirement which sets the minimum skills and capabilities to practice, but as the professional moves through his or her career, the required skills and capabilities change and evolve. In general, engineers are licensed as a means of protecting the public from unqualified individuals. In some countries, no one can practice as a professional engineer unless licensed; or further, no company may offer “engineering services” unless at least one licensed engineer is employed there. Codes of ethics and professional conduct comprise the values and behavior that an engineer’s professional practice and decisions should embody. The professional community establishes codes of ethics and professional conduct. They exist in the context of, and are adjusted to agree with, societal norms and local laws. Therefore, codes of ethics and professional conduct present guidance in the face of conflicting imperatives. Once established, codes of ethics and professional conduct are enforced by the profession, as represented by professional societies or by a statutory body. Violations may be acts of commission, such as concealing inadequate work, disclosing confidential information, falsifying information, or misrepresenting one’s abilities. They may also occur through omission, including failure to disclose risks or to provide important information, failure to give proper credit or to acknowledge references, and failure to represent client interests. Violations of codes of ethics and professional conduct may result in penalties and possible expulsion from professional status. Software engineers shall commit themselves to making the analysis, specification, design, development, testing and maintenance of software a beneficial and respected profession. In accordance with their commitment to the health, safety and welfare of the public, software engineers shall adhere to the eight principles concerning the public, client and employer, product, judgment, management, profession, colleagues, and self, respectively. Since standards and codes of ethics and professional conduct may be introduced, modified, or replaced at any time, individual software engineers bear the responsibility for their own continuing study to stay current in their professional practice. advancing the profession through conferences, training, and publications. Participation in professional societies assists the individual engineer in maintaining and sharpening their professional knowledge and relevancy and in expanding and maintaining their professional network. Software engineering standards cover a remarkable variety of topics. They provide guidelines for the practice of software engineering and processes to be used during development, maintenance, and support of software. By establishing a consensual body of knowledge and experience, software engineering standards establish a basis upon which further guidelines may be developed. Appendix B of this 'Guide provides guidance on IEEE and ISO/ IEC software engineering standards that support the knowledge areas of this Guide. The benefits of software engineering standards are many and include improving software quality,helping avoid errors, protecting both software producers and users, increasing professional discipline, and helping technology transition. Software has economic effects at the individual, business, and societal levels. Software “success” may be determined by the suitability of a product for a recognized problem as well as by its effectiveness when applied to that problem. At the individual level, an engineer’s continuing employment may depend on their ability and willingness to interpret and execute tasks in meeting customers’ or employers’ needs and expectations. The customer or employer’s financial situation may in turn be positively or negatively affected by the purchase of software. At the business level, software properly applied to a problem can eliminate months of work and translate to elevated profits or more effective organizations. Moreover, organizations that acquire or provide successful software may be a boon to the society in which they operate by providing both employment and improved services. However, the development or acquisition costs of software can also equate to those of any major acquisition. At the societal level, direct impacts of software success or failure include or exclude accidents, interruptions, and loss of service. Indirect impacts include the success or failure of the organization that acquired or produced the software, increased or decreased societal productivity, harmonious or disruptive social order, and even the saving or loss of property and life. Software engineering services may be provided under a variety of client-engineer relationships. The software engineering work may be solicited as company-to-customer supplier, engineerto- customer consultancy, direct hire, or even volunteering. In all of these situations, the customer and supplier agree that a product or service will be provided in return for some sort of consideration. Here, we are most concerned with the engineer-to-customer arrangement and its attendant agreements or contracts, whether they are of the direct-hire or consultant variety, and the issues they typically address. A common concern in software engineering contracts is confidentiality. Employers derive commercial advantage from intellectual property, so they strive to protect that property from disclosure. Therefore, software engineers are often required to sign non-disclosure (NDA) or intellectual property (IP) agreements as a precondition to work. These agreements typically apply to information the software engineer could only gain through association with the customer. The terms of these agreements may extend past termination of the association. Another concern is IP ownership. Rights to software engineering assets—products, innovations, inventions, discoveries, and ideas—may reside with the employer or customer, either under explicit contract terms or relevant laws, if those assets are obtained during the term of the software engineer’s relationship with that employer or customer. Contracts differ in the ownership of assets created using non-employer-owned equipment or information. Finally, contracts can also specify among other elements the location at which work is to be performed; standards to which that work will be held; the system configuration to be used for development; limitations of the software engineer’s and employer’s liability; a communication matrix and/or escalation plan; and administrative details such as rates, frequency of compensation, working hours, and working conditions. Legal issues surrounding software engineering professional practice notably include matters related to standards, trademarks, patents, copyrights, trade secrets, professional liability, legal requirements, trade compliance, and cybercrime. It is therefore beneficial to possess knowledge of these issues and their applicability. Legal issues are jurisdictionally based; software engineers must consult attorneys who specialize in the type and jurisdiction of any identified legal issues. Software engineering standards establish guidelines for generally accepted practices and minimum requirements for products and services provided by a software engineer. Appendix B of this Guide provides guidance on software engineering standards that are applicable to each KA. Standards are valuable sources of requirements and assistance during the everyday conduct of software engineering activities. Adherence to standards facilitates discipline by enumerating minimal characteristics of products and practice. That discipline helps to mitigate subconscious assumptions or overconfidence in a design. For these reasons, organizations performing software engineering activities often include conformance to standards as part of their organizational policies. Further, adherence to standards is a major component of defense from legal action or from allegations of malpractice. A trademark relates to any word, name, symbol, or device that is used in business transactions. It is used “to indicate the source or origin of the goods” . Trademark protection protects names, logos, images, and packaging. However, if a name, image, or other trademarked asset becomes a generic term, then trademark protection is nullified. The World Intellectual Property Organization (WIPO) is the authority that frames the rules and regulations on trademarks. WIPO is the United Nations agency dedicated to the use of intellectual property as a means of stimulating innovation and creativity. Patents protect an inventor’s right to manufacture and sell an idea. A patent consists of a set of exclusive rights granted by a sovereign government to an individual, group of individuals, or organization for a limited period of time. Patents are an old form of idea-ownership protection and date back to the 15th century. Application for a patent entails careful records of the process that led to the invention. Patent attorneys are helpful in writing patent disclosure claims in a manner most likely to protect the software engineer’s rights. Note that, if inventions are made during the course of a software engineering contract, ownership may belong to the employer or customer or be jointly held, rather than belong to the software engineer. There are rules concerning what is and is not patentable. In many countries, software code is not patentable, although software algorithms may be. Existing and filed patent applications can be searched at WIPO. Most governments in the world give exclusive rights of an original work to its creator, usually for a limited time, enacted as a copyright. Copyrights protect the way an idea is presented—not the idea itself. For example, they may protect the particular wording of an account of an historical event, whereas the event itself is not protected. Copyrights are long-term and renewable; they date back to the 17th century. In many countries, an intellectual asset such as a formula, algorithm, process, design, method, pattern, instrument, or compilation of information may be considered a “trade secret,” provided that these assets are not generally known and may provide a business some economic advantage. The designation of “trade secret” provides legal protection if the asset is stolen. This protection is not subject to a time limit. However, if another party derives or discovers the same asset legally, then the asset is no longer protected and the other party will also possess all rights to use it. It is common for software engineers to be concerned with matters of professional liability. As an individual provides services to a client or employer, it is vital to adhere to standards and generally accepted practices, thereby protecting against allegations or proceedings of or related to malpractice, negligence, or incompetence. For engineers, including software engineers, professional liability is related to product liability. Under the laws and rules governing in their jurisdiction, engineers may be held to account for failing to fully and conscientiously follow recommended practice; this is known as “negligence.” They may also be subject to laws governing “strict liability” and either implied or express warranty, where, by selling the product, the engineer is held to warrant that the product is both suitable and safe for use. In some countries (for example, in the US), “privity” (the idea that one could only sue the person selling the product) is no longer a defense against liability actions. Legal suits for liability can be brought under tort law in the US allowing anyone who is harmed to recover their loss even if no guarantees were made. Because it is difficult to measure the suitability or safety of software, failure to take due care can be used to prove negligence on the part of software engineers. A defense against such an allegation is to show that standards and generally accepted practices were followed in the development of the product. Basic information on the international legal framework can be accessed from the World Trade Organization (WTO). All software professionals must be aware of legal restrictions on import, export, or reexport of goods, services, and technology in the jurisdictions in which they work. The considerations include export controls and classification, transfer of goods, acquisition of necessary governmental licenses for foreign use of hardware and software, services and technology by sanctioned nation, enterprise or individual entities, and import restrictions and duties. Trade experts should be consulted for detailed compliance guidance. Cybercrime refers to any crime that involves a computer, computer software, computer networks, or embedded software controlling a system. The computer or software may have been used in the commission of a crime or it may have been the target. This category of crime includes fraud, unauthorized access, spam, obscene or offensive content, threats, harassment, theft of sensitive personal data or trade secrets, and use of one computer to damage or infiltrate other networked computers and automated system controls. Computer and software users commit fraud by altering electronic data to facilitate illegal activity. Forms of unauthorized access include hacking, eavesdropping, and using computer systems in a way that is concealed from their owners. Many countries have separate laws to cover cybercrimes, but it has sometimes been difficult to prosecute cybercrimes due to a lack of precisely framed statutes. The software engineer has a professional obligation to consider the threat of cybercrime and to understand how the software system will protect or endanger software and user information from accidental or malicious access, use, modification, destruction, or disclosure. warnings of undesirable or dangerous consequences from use or misuse of the software. problems encountered during the development process. clear identification of warnings and critical procedures. Use of software may include installation, operation, administration, and performance of other functions by various groups of users and support personnel. If the customer will acquire ownership of the software source code or the right to modify the code, the software engineer should provide documentation of the functional specifications, the software design, the test suite, and the necessary operating environment for the software. The minimum length of time documents should be kept is the duration of the software products’ life cycle or the time required by relevant organizational or regulatory requirements. Within the practice of software engineering, a software engineer often has to choose between alternative problem solutions. The outcome of these choices is determined by the software engineer’s professional evaluation of the risks, costs, and benefits of alternatives, in cooperation with stakeholders. The software engineer’s evaluation is called “tradeoff analysis.” Tradeoff analysis notably enables the identification of competing and complementary software requirements in order to prioritize the final set of requirements defining the software to be constructed (see Requirements Negotiation in the Software Requirements KA and Determination and Negotiation of Requirements in the Software Engineering Management KA). In the case of an ongoing software development project that is late or over budget, tradeoff analysis is often conducted to decide which software requirements can be relaxed or dropped given the effects thereof. A first step in a tradeoff analysis is establishing design goals (see Engineering Design in the Engineering Foundations KA) and setting the relative importance of those goals. This permits identification of the solution that most nearly meets those goals; this means that the way the goals are stated is critically important. Design goals may include minimization of monetary cost and maximization of reliability, performance, or some other criteria on a wide range of dimensions. However, it is difficult to formulate a tradeoff analysis of cost against risk, especially where primary production and secondary risk-based costs must be traded against each other. A software engineer must conduct a tradeoff analysis in an ethical manner—notably by being objective and impartial when selecting criteria for comparison of alternative problem solutions and when assigning weights or importance to these criteria. Any conflict of interest must be disclosed up front. Engineering work is very often conducted in the context of teamwork. A software engineer must be able to interact cooperatively and constructively with others to first determine and then meet both needs and expectations. Knowledge of group dynamics and psychology is an asset when interacting with customers, coworkers, suppliers, and subordinates to solve software engineering problems. Software engineers must work with others. On one hand, they work internally in engineering teams; on the other hand, they work with customers, members of the public, regulators, and other stakeholders. Performing teams—those that demonstrate consistent quality of work and progress toward goals—are cohesive and possess a cooperative, honest, and focused atmosphere. Individual and team goals are aligned so that the members naturally commit to and feel ownership of shared outcomes. Team members facilitate this atmosphere by being intellectually honest, making use of group thinking, admitting ignorance, and acknowledging mistakes. They share responsibility, rewards, and workload fairly. They take care to communicate clearly, directly to each other and in documents, as well as in source code, so that information is accessible to everyone. Peer reviews about work products are framed in a constructive and nonpersonal way (see Reviews and Audits in the Software Quality KA). This allows all the members to pursue a cycle of continuous improvement and growth without personal risk. In general, members of cohesive teams demonstrate respect for each other and their leader. One point to emphasize is that software engineers must be able to work in multidisciplinary environments and in varied application domains. Since today software is everywhere, from a phone to a car, software is impacting people’s lives far beyond the more traditional concept of software made for information management in a business environment. Engineers desire to solve problems. The ability to solve problems effectively and efficiently is what every engineer strives for. However, the limits and processes of individual cognition affect problem solving. In software engineering, notably due to the highly abstract nature of software itself, individual cognition plays a very prominent role in problem solving. emotional status of the individual. Many, if not most, software engineering problems are too complex and difficult to address as a whole or to be tackled by individual software engineers. When such circumstances arise, the usual means to adopt is teamwork and problem decomposition (see Problem Solving Techniques in the Computing Foundations KA). Teams work together to deal with complex and large problems by sharing burdens and drawing upon each other’s knowledge and creativity. When software engineers work in teams, different views and abilities of the individual engineers complement each other and help build a solution that is otherwise difficult to come by. Some specific teamwork examples to software engineering are pair programming (see Agile Methods in the Software Engineering Models and Methods KA) and code review (see Reviews and Audits in the Software Quality KA). Success of a software engineering endeavor depends upon positive interactions with stakeholders. They should provide support, information, and feedback at all stages of the software life cycle process. For example, during the early stages, it is critical to identify all stakeholders and discover how the product will affect them, so that sufficient definition of the stakeholder requirements can be properly and completely captured. During development, stakeholders may provide feedback on specifications and/or early versions of the software, change of priority, as well as clarification of detailed or new software requirements. Last, during software maintenance and until the end of product life, stakeholders provide feedback on evolving or new requirements as well problem reports so that the software may be extended and improved. Therefore, it is vital to maintain open and productive communication with stakeholders for the duration of the software product’s lifetime. As with engineers of other fields, software engineers must often deal with and resolve uncertainty and ambiguities while providing services and developing products. The software engineer must attack and reduce or eliminate any lack of clarity that is an obstacle to performing work. Often, uncertainty is simply a reflection of lack of knowledge. In this case, investigation through recourse to formal sources such as textbooks and professional journals, interviews with stakeholders, or consultation with teammates and peers can overcome it. When uncertainty or ambiguity cannot be overcome easily, software engineers or organizations may choose to regard it as a project risk. In this case, work estimates or pricing are adjusted to mitigate the anticipated cost of addressing it (see Risk Management in the Software Engineering Management KA). Multicultural environments can have an impact on the dynamics of a group. This is especially true when the group is geographically separated or communication is infrequent, since such separation elevates the importance of each contact. Intercultural communication is even more difficult if the difference in time zones make oral communication less frequent. Multicultural environments are quite prevalent in software engineering, perhaps more than in other fields of engineering, due to the strong trend of international outsourcing and the easy shipment of software components instantaneously across the globe. For example, it is rather common for a software project to be divided into pieces across national and cultural borders, and it is also quite common for a software project team to consist of people from diverse cultural backgrounds. For a software project to be a success, team members must achieve a level of tolerance, acknowledging that some rules depend on societal norms and that not all societies derive the same solutions and expectations. This tolerance and accompanying understanding can be facilitated by the support of leadership and management. More frequent communication, including face-to-face meetings, can help to mitigate geographical and cultural divisions, promote cohesiveness, and raise productivity. Also, being able to communicate with teammates in their native language could be very beneficial. It is vital that a software engineer communicate well, both orally and in reading and writing. Successful attainment of software requirements and deadlines depends on developing clear understanding between the software engineer and customers, supervisors, coworkers, and suppliers. Optimal problem solving is made possible through the ability to investigate, comprehend, and summarize information. Customer product acceptance and safe product usage depend on the provision of relevant training and documentation. It follows that the software engineer’s own career success is affected by the ability to consistently provide oral and written communication effectively and on time. Software engineers are able to read and understand technical material. Technical material includes reference books, manuals, research papers, and program source code. Reading is not only a primary way of improving skills, but also a way of gathering information necessary for the completion of engineering goals. A software engineer sifts through accumulated information, filtering out the pieces that will be most helpful. Customers may request that a software engineer summarize the results of such information gathering for them, simplifying or explaining it so that they may make the final choice between competing solutions. Reading and comprehending source code is also a component of information gathering and problem solving. When modifying, extending, or rewriting software, it is critical to understand both its implementation directly derived from the presented code and its design, which must often be inferred. Software engineers are able to produce written products as required by customer requests or generally accepted practice. These written products may include source code, software project plans, software requirement documents, risk analyses, software design documents, software test plans, user manuals, technical reports and evaluations, justifications, diagrams and charts, and so forth. Writing clearly and concisely is very important because often it is the primary method of communication among relevant parties. In all cases, written software engineering products must be written so that they are accessible, understandable and relevant for their intended audience(s). Effective communication among team and group members is essential to a collaborative software engineering effort. Stakeholders must be consulted, decisions must be made, and plans must be generated. The greater the number of team and group members, the greater the need to communicate. The number of communication paths, however, grows quadratically with the addition of each team member. Further, team members are unlikely to communicate with anyone perceived to be removed from them by more than two degrees (levels). This problem can be more serious when software engineering endeavors or organizations are spread across national and continental borders. Some communication can be accomplished in writing. Software documentation is a common substitute for direct interaction. Email is another but, although it is useful, it is not always enough; also, if one sends too many messages, it becomes difficult to identify the important information. Increasingly, organizations are using enterprise collaboration tools to share information. In addition, the use of electronic information stores, accessible to all team members, for organizational policies, standards, common engineering procedures, and project-specific information, can be most beneficial. Some software engineering teams focus on face-to-face interaction and promote such interaction by office space arrangement. Although private offices improve individual productivity, colocating team members in physical or virtual forms and providing communal work areas is important to collaborative efforts. Software engineers rely on their presentation skills during software life cycle processes. For example, during the software requirements phase, software engineers may walk customers and teammates through software requirements and conduct formal requirements reviews (see Requirement Reviews in the Software Requirements KA). During and after software design, software construction, and software maintenance, software engineers lead reviews, product walkthroughs (see Review and Audits in the Software Quality KA), and training. All of these require the ability to present technical information to groups and solicit ideas or feedback. The software engineer’s ability to convey concepts effectively in a presentation therefore influences product acceptance, management, and customer support; it also influences the ability of stakeholders to comprehend and assist in the product effort. This knowledge needs to be archived in the form of slides, knowledge writeup, technical whitepapers, and any other material utilized for knowledge creation. Gerald M. Weinberg, The Psychology of Computer Programming . This was the first major book to address programming as an individual and team effort and became a classic in the field. Kinney and Lange, P.A., Intellectual Property Law for Business Lawyers . This book covers IP laws in the US. It not only talks about what the IP law is; it also explains why it looks the way it does. F. Bott et al., Professional Issues in Software Engineering, 3rd ed., Taylor & Francis, 2000. Merriam-Webster’s Collegiate Dictionary, 11th ed, 2003. IEEE CS/ACM Joint Task Force onSoftware Engineering Ethics and Professional Practices, "Software Engineering Code of Ethics and Professional Practice (Version 5.2)", 1999, www.acm.org/serving/se/code.htm. G.M. Weinberg, The Psychology of Computer Programming: Silver Anniversary Edition, Dorset House, 1998. Kinney and Lange, P.A., Intellectual Property Law for Business Lawyers, Thomson West, 2013. This page was last modified on 29 August 2015, at 15:52.